A low-pass filter is a filter that allows signals below a cutoff frequency (known as the passband) and attenuates signals above the cutoff frequency (known as the stopband). By removing some frequencies, the filter creates a smoothing effect. That is, the filter produces slow changes in output values to make it easier to see trends and boost the overall signal-to-noise ratio with minimal signal degradation. 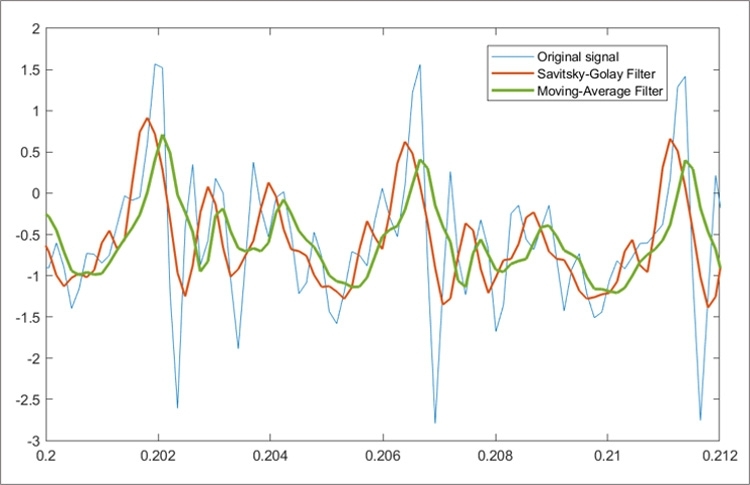 Low-pass filters, especially moving average filters or Savitzky-Golay filters, are often used to clean up signals, remove noise, perform data averaging, design decimators and interpolators, and discover important patterns. Other common design methods for low-pass FIR-based filters include Kaiser window, least squares, and equiripple. Design methods for IIR-based filters include Butterworth, Chebyshev (Type-I and Type-II), and elliptic.